Factory Assembly is the city’s major annual conference for the creative industries. A limited number of free tickets available are still available for this Conference taking place in Longton on 25th September 2014. Keynote speakers include Ian Livingstone the UK’s creative industries champion; Wayne Garvie of Sony Entertainment and one of international TV’s leading creative thinkers; plus others speakers and free practical workshops and talks. A major appeal has been launched to save the Wedgwood Collection of ceramics for Stoke and Staffordshire. Added to the Directory: Fantasy Wire Fairies Sculptures, wire sculptures from Staffordshire. Picture: Fantasy Wire sculpture at Trentham Gardens. There is a major new Sculpture Trail for Stoke-on-Trent, and associated website. Added to the Directory: TDV Productions – video production specialising in Google Adwords for Video. Added to the Directory: Custard Photography – professional photography Studio in Hanley, Stoke-on-Trent. Under One Roof: Social Enterprise project is set for a launch event, at Keele on 14th October 2014. This looks like it will be of interest to anyone thinking strategically about social enterprises in Stoke and Staffordshire. Staffordshire University has launched two new Distance Learning Courses in Design Management. Live Age Festival: a celebration of creativity in later life, on Wednesday 1st & Thursday 2nd October 2014, at the Potteries Museum & Art Gallery and the Mitchell Arts Centre, Stoke-on-Trent. Full programme is now available. 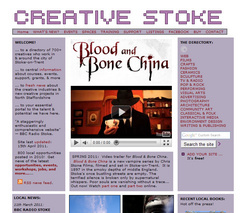 Stoke-on-Trent arts organisation B Arts needs a new Chair of the Board. Deadline: 26th September 2014. The Potteries Hackspace has a super new website. The dedicated photography gallery in Stoke town, Gallery 116, is calling for selling pictures to show in their galleries. There will be sculpture-making weekends in Staffordshire, for adults, in October and November 2014. The Sentinel newspaper and the Staffordshire Community Foundation are inviting local volunteer-run organisations to apply for grants of between £500 to £3,000. Deadline 30th September 2014. The Clore Duffield Foundation is now open to applications as part of its £1 million programme to fund poetry and literature initiatives for children and young people across the UK. Through the programme, schools, F.E. colleges, community groups, libraries and other local arts/cultural organisations can apply for grants of between £1,000 and £10,000 to support participatory learning projects and programmes focused on literature, poetry and creative writing for under 19s. Deadline: 6th March 2015. Youth Music, England’s largest children’s music charity, which provides funding for music-making projects, has several new grants schemes available. Charities, not for profit organisations and schools can apply. Schools must show how the activities to be funded do not duplicate Department of Education funding. Write a Staffordshire story, win £100, and see it printed in a major county newspaper.